Formula Growth Limited (“FG”) is a 100% employee owned, independent boutique investment advisor. Founded in 1960 by John Dobson, FG quickly became known for its successful track record of global bottom-up growth stock investing with the original long-only product, the Formula Growth Fund (FGF). Initially catering to high net worth individuals, FG began managing institutional assets in February of 1976 with the creation of a second product called the Formula Unit Trust. Recognizing the volatility and limitations inherent in long-only growth stock investing, FG launched the Formula Growth Hedge Fund (FGHF), a U.S. equity long/short platform in 2002. This new strategy allowed FG to increase its portfolio management capabilities and flexibility by adding a variety of new tools such as heightened risk management, short selling and variable market exposure. Further to its success with the FGHF, the global equity long/short Formula Growth Global Opportunities Fund (GOF) was launched in January 2009. This strategy builds on the core long/short experience FG built over the years by focusing on growing companies based in or benefiting from the rise of the Asia-Pacific region. In 2011, FG conceived and developed the Alpha platform with the launch of the FG Alpha Fund. This strategy is a directionally capped equity long/short fund designed for institutional investors pursuing lower volatility. FG has operated in Montreal since 1960 and today has research offices in New York City and Hong Kong as well. These international research offices significantly increase global research capabilities. FG established an advisory partnership with the Hong Kong based firm, the PheonixInvest Group Ltd led by James Soutar in 2009. In February 2016, FG acquired a controlling interest in the firm. This relationship provides the research team, among other benefits, access to a local office and an established network of buy and sell-side professionals in the Asia-Pacific region. John was born in Montreal in 1928. He was the son of a banker who rose through the ranks to become President of the Royal Bank of Canada. While John was of Nova Scotia heritage (his father from Sydney and his mother from Truro), he grew up in Montreal and graduated from McGill University with a Bachelor of Commerce in 1949. He received his Masters of Business of Administration from Harvard in 1952. John began his formal work career with Dominion Engineering, and then the Montreal investment firm, of C.J. Hodgson. This background prepared him to venture on his own in 1960 when he founded The Formula Growth Fund, one of Canada’s earliest mutual funds and one of the most successful long-term mutual funds in Canadian history. While studying for his MBA, John attended the small business class at Harvard University. It was from that early exposure and his teaching experience that he developed the vision of University involvement in entrepreneurial studies and community entrepreneurial outreach as an effective stimulant to economic development and employment generation. 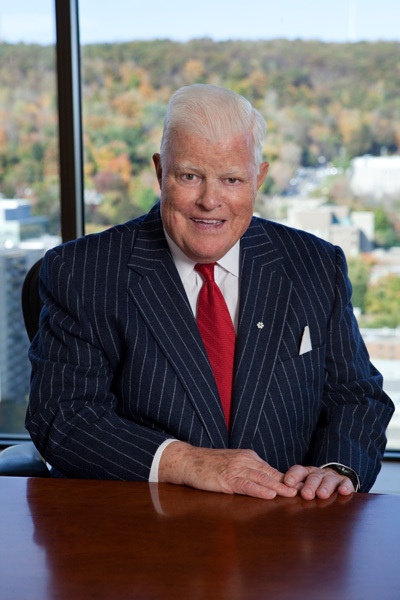 John began teaching the business case method in the late 1950’s in a program sponsored by the Montreal Board of Trade along with a number of Harvard Alumni and other Montreal executives. This program eventually found a home at McGill in what is know today as the Executive Development Institute. The first and flagship activity of the Foundation was the creation of the Dobson Centre for Entrepreneurial Studies at McGill University in 1989. The Foundation has created the McGill Entrepreneurial Skill Development Program and today there are 13 sections of entrepreneurial studies in programs in Business, MBA, Engineering, and Science. The John Dobson Foundation has supported entrepreneurial development at more than a dozen Canadian universities. In addition to the enhancement of entrepreneurial education at specific institutions, John’s involvement has resulted in the establishment of regional and national networks of educators and small business interveners creating unprecedented synergy and cooperation. Over the years, John also applied his extensive management skills and business acumen in a variety of voluntary positions including: a member of the Fraser Institute Boards of Trustees, a member of the International Advisory Board of the McGill School of Management as well as the Audit and Finance Committee of McGill University. John was also an Advisor to the National Citizen’s Coalition. He was awarded an honorary Doctorate from McGill in 1996, another from Concordia in 2002. He was awarded McGill’s Management Achievement Award in 1992, and in 1997 John was named to the Order of Canada. In addition to his commitment to the community, education, and entrepreneurship, it is golf that had been his life long passion. He had served as a member of the executive committee and Director of both the Quebec Golf Association and the Royal Canadian Golf Association, and as an honorary Director of the Quebec Golf Professionals. He had played almost 700 different golf courses worldwide.